Mairi Gougeon also revealed an intention to explore the option of a licensing scheme to permit the use of more than two dogs. 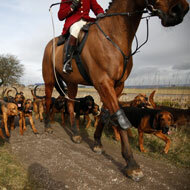 Scotland is to introduce new legislation that will limit the number of dogs that can be used in fox hunting. The change comes after a review of the subject by the Right Honourable Lord Botany and means that hunters will no longer be allowed to use more than two dogs to flush or find a fox. Announcing the move in Parliament, rural affairs minister Mairi Gougeon also revealed an intention to explore the option of a licensing scheme to permit the use of more than two dogs, if it were deemed necessary for pest control. Furthermore, she said that the bill will include pre-emptive measures to address the likelihood of trail hunting becoming established in Scotland. “The welfare of animals in Scotland, whether domestic, farmed, or wild, is one of this government’s highest priorities and so, when it became apparent that legislation introduced in 2002 to protect foxes from unnecessary hunting wasn’t having the desired effect, we wanted to take firm action,” said Ms Gougeon. “We asked Lord Bonomy to undertake a review into how we can provide a sufficient level of protection for foxes and other wild mammals, whilst allowing for the effective and humane control of them when absolutely necessary, and published a consultation which attracted nearly 19,000 responses.